At Nordique we always love to profile the very best of Scandinavian interior design, and this stunning flat in Stockholm is really hard to beat. The traditional high ceilings and large windows create a feeling of light and space, but the modern, dark fittings add a sophisticated edge to the rooms. 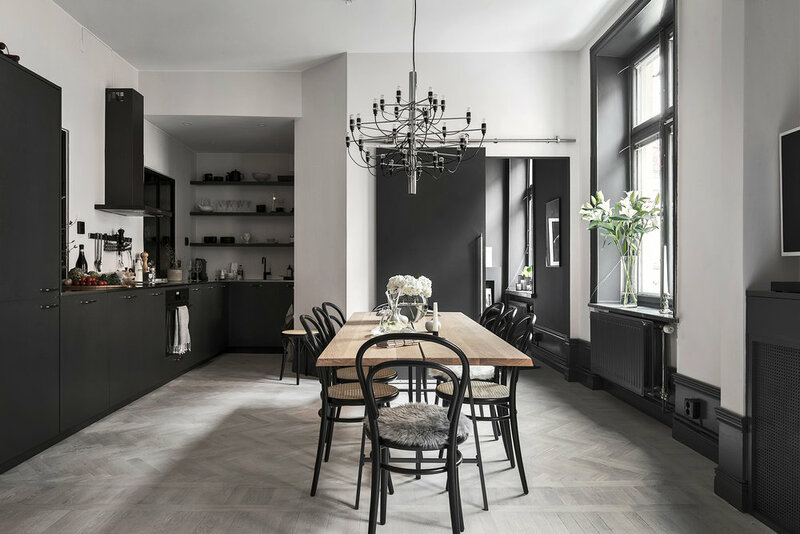 We love the beautiful birchwood parquet floor, which couples the a classic herringbone design with modern, Scandinavian materials. 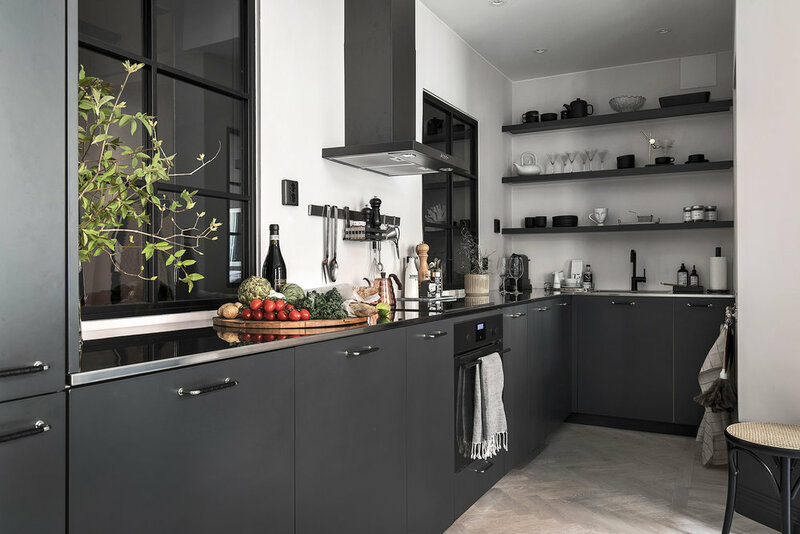 It contrasts beautifully with the bold, striking, matt black kitchen units and fittings to maintain the clean lines for which Nordic interior design is famous. 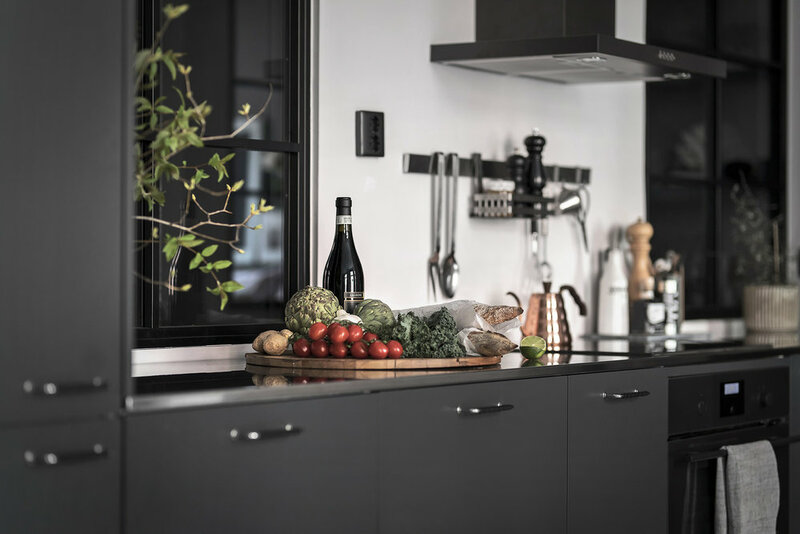 Dark glossy worktops are not traditionally associated with Scandinavian kitchens, but in this setting they look very classy indeed. Fresh cut flowers nicely offset the bold monochrome colour scheme, while the intricate light fitting is a lovely feature in a large, high ceilinged room like this. The bold monochrome theme continues in the living area, complemented by the very on-trend use of ferns and other house plants to offer a more rounded, homely look. The large, square rug in muted grey tones draws the room together and offers a cool cosiness. The furnishings are very on-trend, with a nod to retro-Nordic styles - particularly the leather armchair and seat in the hall area. Faux-fur throws add warmth and soft features but maintain the stylish, muted colour scheme. Clustering pictures on a large wall can be a very effective style tip, but try to ensure that they have a similar tone or colour scheme for optimal effect. Bespoke inbuilt shelving units are a great storage solution, particularly for city apartment living! The colour scheme continues in the bedroom area, although the use of more prints and photographs makes for a cosier feeling to the room. How about this balcony as a spot to enjoy breakfast, or a few drinks on a warm summer's evening? !